There are various things people can do to cover up, disguise or beautify certain features they find less attractive or unattractive. Alas, the nose is not one of those features we can hide. Because the nose is also prominent it can make a huge difference in an individual’s physical appearance. And because the nose protrudes, it can detract from other facial features that you do want to show off. If you have a nose that you are less than happy with, there are plenty of solutions to improve it, either in a minor or a major way. This piece looks specifically at nasal implants. Singapore has clinics and qualified doctors who can deliver. They have vast experience in this and many other cosmetic procedures. The position and construction of the nose also makes it particularly vulnerable to accident and injury. From a patient’s side, it’s crucial to make your decisions with the utmost care and consideration. The idea of rhinoplasty surgery is to improve your looks not worsen them. No one should ever take any surgical procedure lightly, especially with something as pronounced as the nose on their face. Even with nasal implants, you still need to have realistic expectations. You also need to prepare yourself fully for the procedure and its outcome. Whenever possible, a surgeon will suggest using the patient’s own cartilage. This will likely be ear and/or septal nasal cartilage if the option is there. Unfortunately, septal nasal cartilage is less abundant in Asian noses. In Caucasians there’s generally more of it and it’s stronger too. In cases where it’s not possible to use the patient’s own cartilage, bone, or other soft-tissues, synthetic options may work. The downside is that there are more “potential” complications with synthetic implants. This is why tissue from the patient’s body is preferable when possible. Your surgeon will go over these things with you during your consultation at the clinic. They will also discuss in some details the benefits and pitfalls for the various synthetic materials. As the name suggests, open rhinoplasty is not hidden, there’s a visible scar. In this case the surgeon still makes the internal incisions but with an extra incision. This one is on the under surface of the tissue that separates the nostrils (columella). Because of this external incision, the patient can expect a small visible scar after surgery. A skilled surgeon should be able to make this incision barely noticeable though. In fact, in the majority of cases it heals to the point where it’s no longer visible, at least not to other people. In general, a closed rhinoplasty takes less time than an open procedure. There is normally less swelling at the tip too, and no external scar of course. In cases where the patient needs extensive dorsal or tip work doing the open rhinoplasty is the only way to go. What your plastic surgeon does is assess your overall nose structure and also your face profile. 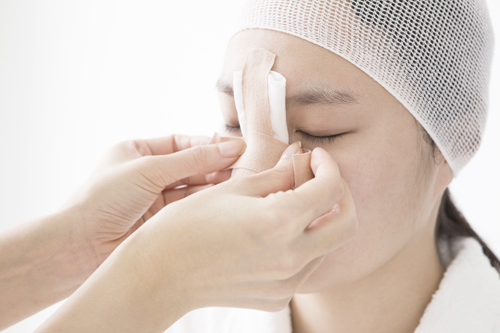 It is only by doing this that they can decide whether to go with an open of closed rhinoplasty. Although every case is unique, the average recovery time is around seven to ten days depending on the patient and the job. You will have to wear tapes for a few days after surgery as a way to help reduce any “potential” swelling. The clinic will remove these tapes for you when the time is right. Some patients may experience a bit of pain, and almost everyone is subject to some degree of discomfort post-op. Your clinic will provide you will suitable painkillers to manage any pain and discomfort that may occur. As mentioned earlier in the piece, this is not the kind of surgical procedure that you want to go bargain hunting for. There are plenty of clinics around the world that operate underground and quite unregulated. They attract potential clients with low fees, but it is a dangerous move for anyone to make as you cannot guarantee the outcome. If you’re someone who is looking for nasal implants, Singapore is one of the best places you can head to if you’re in the Asia region. Here, many of the doctors are US trained, highly skilled and very experienced. There are strict industry regulations in Singapore too. The clinics here use only the latest, state-of-the-art technologies and procedures. Wherever you go, the most important thing above all else is to choose your doctor with care. Don’t make any decisions in haste or one based purely on budget.